NBC television recorded over 70 hours and 25 minutes of coverage on President John F. Kennedy's assassination beginning on November 22nd and ending on November 25th, 1963. However, NBC failed to record the first two NBC television bulletins on Nov. 22, voiced by Don Pardo, at 1:45:03 PM EST & 1:46:45 PM EST, and the subsequent initial 3 minutes & 53 seconds of continuous coverage by Frank McGee, Chet Huntley and Bill Ryan, commencing at 1:53:12 PM EST. Amazingly, the only existing broadcast record in the world, to date, of these historic television moments was audio recorded off the air by Phil Gries, developer and owner of Archival Television Audio Inc. These TV audio airchecks were recorded via direct line on a 1/4" reel to reel audiotape recorder during the actual live television broadcast. These historic soundtracks have been donated by ATA to the John F. Kennedy Library in Boston, MA, and to The Library of Congress in Washington D.C. In addition, Archival Television Audio, Inc. has given a copy to a stunned Don Pardo on his 80th birthday, now believing that his bulletins exist as a broadcast record and not just as a memory. The November 22nd, 1963 John F. Kennedy NBC-TV assassination bulletins, and the initial lost three minutes & 53 seconds of NBC live coverage are the most significant treasure in our over 12,000 program archive. These tracks personify just one of the many thousands of other Archival Television Audio original off the air TV soundtracks, representing the only broadcast record in the world of an original television program (1946-1979) which has been erased, damaged, misplaced, or destroyed during the first three decades of television broadcasting. 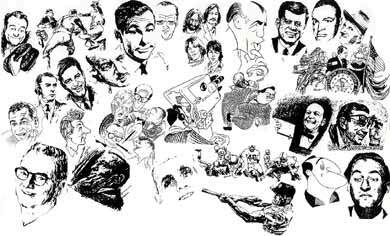 #556- NBC'S FIRST LIVE BULLETINS AND LIVE COVERAGE OF THE ASSASSINATION OF PRESIDENT JOHN F. KENNEDY. I have recently purchased this tape from you, and it leaves me breathless! I videotaped A&E's replay in 1988 with Edwin Newman, and PBS re-played the coverage again in 1993, I believe. I've watched these tapes over and over, but always there was that annoying missing part at the beginning. What did those men say before the taping began? What was Bill Ryan thanking Frank McGee for? For years, I thought, gee, isn't it a shame that somebody somewhere didn't think to turn on a tape recorder! And now I find that YOU DID! This is SO fascinating to me. Have you ever told the story of how you happened to do it? Can you point me to some resource where there is an article about it? Did you just happen to have your TV on at that moment, see the "Bulletin" come up and rush over to turn your spare tape recorder on? In response to your inquiry regarding the audio taping of the first Don Pardo NBC television bulletins related to the assassination of President John F. Kennedy on November 22, 1963, beginning at 1:45:03 PM Eastern Standard Time, and the first 3 minutes and 53 seconds of coverage not recorded by NBC or any other archive or individual in the entire country, except yours truly...I'm astonished that I was the only one to record these historic media moments. Over the decades I've been expecting another resource to affirm and confirm a similar recording. Thus far there have been none. It was fate that I had the passion to audio record my television set in the late 1950's, and 1960's, and it was fortuitous fate that I was home that Friday afternoon, and that I had just concluded taping, from 1:00 to 1:30 PM, the audio of the last WNBC complete television program to air ("TELL US MORE" with Conrad Nagel profiling a biography of Jack Benny and Fred Allen), until NBC resumed normal broadcasting 70 hours and 25 minutes later, after commercial television and advertising left the air beginning on Friday at 1:57:00 PM EST when NBC began recording their coverage of the Kennedy Assassination with Bill Ryan stating to Frank McGee: "Thank you Frank." My 1949 16 & 1/2'' Andrea television remained on after I completed audio taping "TELL US MORE," and when I saw the NBC station bulletin ID on the screen, 15 minutes later, I immediately pushed the record button on my 1959 Webcor two track stereophonic tape recorder and recorded NBC's coverage from the beginning of Don Pardo's first New York City local bulletin and then recorded, off the air, his first National bulletin. I personally believe (my memory fails me) that I missed a few seconds leading into the "lost" 3 minutes and 53 seconds of Bill Ryan's on the air reporting, commencing at approx. 1:53 PM EST. In retrospect, I should have kept my recorder running continuously after the first bulletins. Instead, I waited to see what new developments would occur, waiting again for NBC to interrupt regular programming which occured at approximately 1:53 PM EST. It took NBC approximately 11 minutes for their cameras to function live from the time Don Pardo voiced his first bulletin on NBC TELEVISION at 1:45:03 Eastern Standard Time, and to then videotape their own coverage (70 hours & 25 minutes) beginning with Bill Ryan saying to Frank McGee: "Thank you Frank." at approximately 1:57 PM EST. I personally held on to and preserved these TV audio airchecks, which I recorded off the air, for 34 years, not sharing them until 1997 when I released them. Currently, the "lost" NBC TELEVISION first two Don Pardo bulletins and the "lost" first 3 minutes & 53 seconds of non existing videotape/kinescope NBC footage resides with the JOHN F. KENNEDY LIBRARY, THE LIBRARY OF CONGRESS, THE MUSEUM OF TELEVISION & RADIO, and with Mr. Don Pardo, to whom I presented these TV SOUNDTRACKS at the time of his 80th birthday, in February of 1998. If you would like any additional information, please don't hesitate to e-mail me or phone me (516-656-5677). My story of how I recorded the lost JFK coverage has never been fully reported. One day I would like to have someone publish the exact details beyond what I have stated in this reply. Parts of my story have appeared in profiles on me in the New York Daily News (Jan. 1, 1996), N.Y. Times (June 28, 1998), Newsday (October 4, 1998), and the New York Post (December 29, 2000), and I was profiled on National Public Radio's ALL THINGS CONSIDERED ("LOST AND FOUND SOUND") on November 19, 1999. That audio can be streamed on the NPR Website. Thank you for your kind words and your interest. I'd like to add your correspondence and my reply to our link on the John F. Kennedy assassination. ARCHIVAL TELEVISION AUDIO, INC. OFFERS A SPECIAL COMPILATION AUDIO CASSETTE TAPE (TOTAL RUNNING TIME - 10 MINUTES, 16 SECONDS) WHICH INCLUDES THE FOLLOWING MATERIAL RELATED TO THE NBC TELEVISION COVERAGE OF THE NOVEMBER 22, 1963 ASSASSINATION OF PRESIDENT JOHN F. KENNEDY. TELEVISION AUDIO AIRCHECK OPENING OF THE NOVEMBER 22, 1988 A&E TV SPECIAL (25TH ANNIVERSARY), REMEMBERING THE JFK ASSASSINATION AS ORIGINALLY BROADCAST ON NBC. HOST EDWARD NEWMAN INTRODUCES THE PROGRAM AND REMINDS THE VIEWING AUDIENCE THAT NBC WAS NOT ABLE TO ARCHIVE THE FIRST TWO NBC BULLETINS OR THE FIRST MINUTES OF ORIGINAL LIVE NBC SPECIAL COVERAGE. NEVER RECORDED BY NBC, THE FIRST TWO "LOST" DON PARDO BULLETINS, AND THE FIRST 3 MINUTES & 52 SECONDS OF "LOST" NBC-TV COVERAGE OF THE JOHN F. KENNEDY ASSASSINATION ON NOVEMBER 22, 1963, WITH COVERAGE BY BILL RYAN, CHET HUNTLEY AND FRANK McGEE. BRIEF EXCERPT OF PHIL GRIES TELEPHONE CONVERSATION WITH ANNOUNCER DON PARDO REGARDING THE BULLETINS HE VOICED ON NOVEMBER 22, 1963, BEGINNING AT 1:45:03 EST.